I ended this blog four years ago, but messages still trickled in now and then from people wondering whether I could put these posts in book form so they could give it as gift to family or friends. So I did! 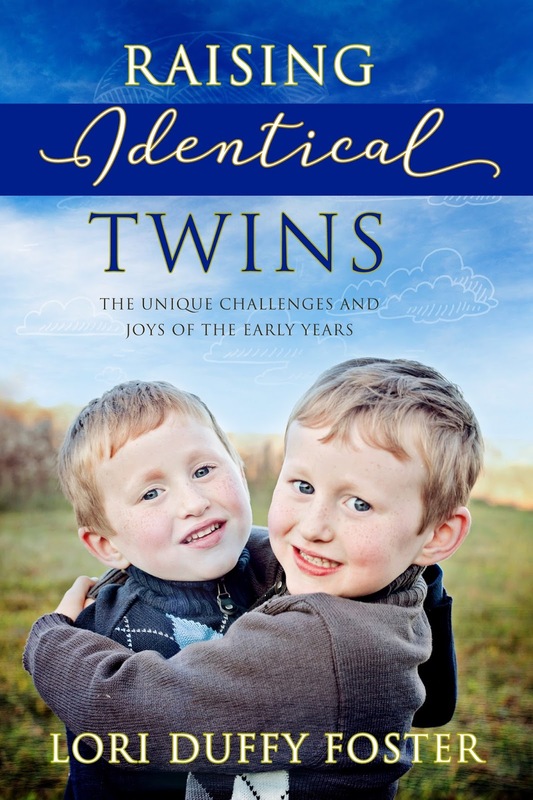 Raising Identical Twins: The Unique Challenges and Joys of the Early Years combines the six years worth of blog posts with facts, advice and studies specific to children who share DNA. It is intended to entertain and inform while, hopefully, spreading some of the happiness and love our twins have brought us throughout the universe. Matthew and Jonathan have an odd dynamic when they deal with issues of frustration and anger, and I wonder whether we're alone in this. 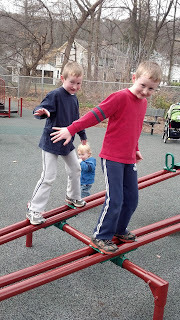 The boys are getting older -- they will be six in eight days -- so I will not apply names to their specific behaviors. I feel I need to change the way I write about them as they age to protect their privacy in ways that will matter to them in the future. But here's how it works. One twin has a harder time than the other dealing with losing or not achieving his goals. Boy does he get mad! He yells and stomps and hollers and, if some unfortunate Wii remote or game piece happens to be in his hands, he throws it. But he rarely hurts people. His anger is directed at himself and the particular challenge. As we struggle to deal with this -- giving time-outs, talking with him, refusing to play with him unless he calms down, prohibiting certain trigger games for a while, offering him de-stressing techniques, tearing out what remains of our hair, gulping that glass of wine -- we face another obstacle. The other twin instantly reacts to his brother's emotions by hitting him or pinching him as hard as he can. If we're not in the room, it turns into an all-out brawl. The offending twin doesn't know why he does this and can't seem to stop himself. It could be because he knows his brother's behaviors will bring an end to the fun, and we've tried addressing that. We've tried continuing the activity with the other twin (after a time-out for hurting his brother, of course), but he does this even if he's not been involved in the activity. So I'm wondering whether it really has to do with their immediate and obvious impact on each other or whether it's like their other empathic reactions -- they way they each get upset when the other is sad, or plead for the release of the twin who is in time-out, or refuse to sleep in our bed when they wake during the night for fear of leaving the other twin alone. Maybe the one twin just can't stand the strength of his brother's emotions, so his tries to stop him for his own sake the only way he knows how. He reacts this way during play dates, but not when his brother melts down in school. Instead, he steps back in school, away from the staff and other students who are trying to calm his brother down. My guess is that he controls himself because of the environment. We tend to let loose among those who love us unconditionally, like mom and dad. We are working with the twin who has trouble losing. He is making progress, very slow progress at home and a little more progress at school, but nothing we do alters the reaction of his brother. Still, in the midst of chaos -- flying Wii remotes, pinching fingers and time-outs -- I find myself intrigued, wondering what inspires him to do this. Why can't the one twin allow his brother to experience frustration on his own? Why can't he just let him be angry? 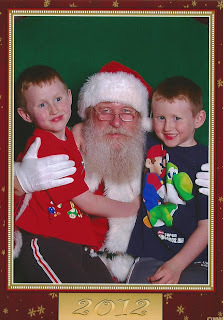 "I remember you two," Santa exclaimed when Matthew and Jonathan climbed on his lap at our local mall a few weeks ago. Last year, the boys lured him into the center court so they could point out the Pillow Pets they wanted in a nearby kiosk. As their sixth birthday approaches, Jonathan and Matthew remain Santa obsessed. Here are photos taken with three different Santas this year (Some are Santa's helpers, of course! Matthew and Jonathan pulled a few beards trying to distinguish the real thing from the stand-ins.). Jon on the left, and Matt on the right at the mall. 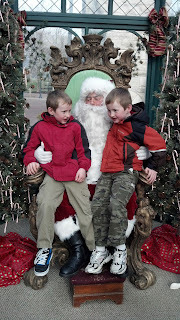 Matthew on the left and Jonathan on the right in Corning, N.Y. Early results are in: the twins are thriving in the same classroom. Last week, I had our first conference with Matthew and Jonathan's kindergarten teacher. Their teacher admitted he was hesitant when he learned we had requested that they be in the same classroom and, for those first few days, there were some issues. Mostly, he said, Jonathan and Matthew had to learn they could not get physical with each other in school - no poking or prodding allowed. But now, he said, "they're just like any two kids in the classroom. When there are issues, they are just boy issues -- boys being boys." He no longer even relies on clothing to tell them apart. Their report cards were not identical, but they were very similar. In the few areas where they differed academically, personality had a strong influence. For instance, Matthew's report card showed he could count only to 30 while Jonathan's showed a limit of 100. Matthew has been counting to 100 since he was three. It's always been a game for him and his twin brother, counting in the back seat as we drove. They also learned to count by tens at an early age. So I know he knows this stuff. But while Jonathan sees any kind of testing as a challenge, Matthew finds it annoying. He is is easily bored with reading aloud, counting and any other form of quizzing, preferring to deny knowledge so he can move on to more active pursuits. Homework with him is already a struggle. Emotionally and socially, I saw the personality differences that have always been apparent reflected. Jonathan wears his emotions tattooed prominently across his forehead. When is angry, he is very angry. When he is sad, he is a blubbering ball of emotions. Matthew has greater control and, though this was not on the report card, he certainly knows how to push his twin's buttons. He is emotional as well, but he is more covert -- just slightly less likely to lose his cool. Each has his own friends and a few shared ones, though they claim they are often picked on by the same girl. Our oldest daughter complains she can rarely sit with them at lunch. They usually sit at separate tables and she doesn't want to choose one over the other. Gym class worried me the most though. The boys are highly competitive and they can become physically abusive to each other when they argue over games or races. But their gym teacher assured me they rarely even communicate in her class. Each goes off with his own his own group and does his own thing. Their issues in gym are more typical of their development as individuals. In the beginning, they would each get upset it they did not get the color of their choice, or if they did not get a turn. That has improved, she said, more so with one twin making bigger strides than the other (Guess who!). A few days after the conference, I asked Matthew and Jonathan whether they enjoy being together in school and whether they might want to stay together next year. Normally, Jonathan would begin to tear up at the thought of any separation that lasts more than a few hours, and Matthew would pounce on that, insisting they each go their own way just to a reaction. We know this because if we actually try separating them, Matthew is the first to break down. This time, however, Matthew was the first to react positively, nodding his head vigorously. "I want to be with my brother," he said. "Yeah," Jonathan said, smiling. "Me too." Scientists practically drool over identical twins and their shared DNA, especially when one twin develops a major, and possibly genetically related illness, and the other does not. Identical twins can help unlock medical mysteries that might otherwise go unsolved. The results of a recent study on breast cancer can help the rest of us appreciate the scientific fever over identical twins and their potential contributions. The study -- led by Manel Esteller, director of the Cancer Epigenetics and Biology Program at the Bellvitge Biomedical Research Institute (IDIBELL), Professor of Genetics at the University of Barcelona and ICREA researcher -- has helped researchers identify a genetic change that occurs in those who will later develop breast cancer. This information could lead to new blood tests that help doctors identify breast cancer victims long before their cancers actually develop. It could lead to new drugs that more efficiently target tumors and that prevent breast cancer in the first place. It all goes back to epigenetics. All DNA is influenced by environment. Chemical signals received by DNA can trigger certain changes, turning genes off and on like a light switch. That's the theory behind epigenetics. It's why some pairs of identical twins have clear physical differences, like height or moles or head shape. It explains lower immunity in one twin than in another. It shows why some will develop certain genetic diseases while their twins do not. In this case, researchers found that twins with breast cancer had "a pathological gain of methylation in the DOK7 gene" years before their cancer was clinically diagnosed, according to Dr Esteller in an article on the institute's website. The next step for the researchers will be knowing the exact function of the DOK7 gene. "We believe it is a regulator of tyrosine kinases, an antitumor drug target already used for the treatment of breast cancer. If DOK7 performs this function, new studies to test drugs with tumour chemopreventive effects in breast cancer could be planned in the future," he concludes. In simpler terms, scientists believe that particular gene is a regulator of a drug already used to fight tumors. If that proves true, the information could lead to big changes in the way we diagnose, treat and prevent breast cancer. A simple blood test could tell women (And men. Let's not forget they can have breast cancer too.) whether they will develop the disease in the near future. All thanks to 36 sets of selfless identical twins. I had worried that Matthew and Jonathon would be labeled by their shared DNA in school. But does anyone say, "Hey, are you the mom of the identical twins?" They say, "Hey, you're the mom of the tall twins, aren't you?" Yes, Jonathan and Matthew have a greater claim to fame. They are off the charts for height, just like their older brother and sister, and thanks, probably, to their six-foot-five dad. I haven't measured them since July, but they were 50 inches tall then. At five years old, that puts them in the highest category, according the National Centers for Disease Control: "above the 95th percentile." Their height has always been a problem. Public tantrums were bad when they were three years old, especially since they fed off each other. But they were made worse by people who assumed they were two years older. Once, a woman who saw one twin melting down in typical 3-year-old fashion as we passed the grocery store's chip selection -- a total stranger -- told me I should beat him because he was too old to behave that way. Several times when we visited the mall on their day off from preschool, some older woman (why the older women?) or a store clerk would demand to know (not "ask," but "demand") why they weren't in school. I admit I took pleasure in watching their nosy jaws drop when I'd say they were only four. So I knew they were taller than average and I knew their height might someday be an issue. But, honestly, I didn't realize the difference was that great. Few people said anything when they were in preschool. But the private preschool they attended two days a week was small and two other boys were not far behind them in height. The public preschool, where they now attend kindergarten, had a much larger class, but the kids were tucked away on one end of the building, at least during the two days the twins attended. Few people outside the preschool ever saw them. Now they are in the hallways, on the playground and in the cafeteria with the rest of the elementary school crowd. Their little (still "little" to me) heads shoot up above their classmates, more on level with the first- and second-graders than with their peers. It might not seem like a handicap. People tend to reserve that stereotype for shortness. Even when people know how old they are, it's hard to conceive. They subconsciously raise their expectations ... just like I do ... just like I have always done to their older brother and sister, despite my best efforts. Once again though, their twinness comes to the rescue. Rarely do they care what others think. They have that confidence -- that impenetrable space between them -- that they derive from each other. They are, as they might say, "cool with it."